I am looking to build a scan of strong stocks pulling back. 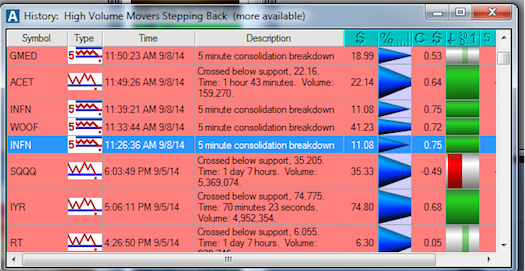 I am looking to have it send an alert when something up this morning on volume pulls back to a 5min 60 period EMA. I see a few built in moving averages but not this one. Trade-Ideas Pro currently only looks at simple moving averages. You are not able to use a moving average that is not in the current inventory of available alerts or filters. Ok well the 5 60 should be close to the 15 20 simple ema. I see a filter for that in trade ideas wondering how i would write approaching using the change from. Thats great thanks. but im looking for something a little different. I have been trying this myself but cant see to get it. Im looking for stocks like INFI today when it was strong early and starting to pull back. I found the 20 EMA on 15's a good starting point but we can use SMA since we cant use EMA. I also tried the stock like this area of the site but thats really scary lol. Ok. Leaving behind all the previous indicator specifics and just focusing on the description of your preferred pattern and an example of a stock in such a pattern. I have something below that featured INFN at 11:30am ET today and that is highlighted in the picture below. First the strategy: "High Volume Movers Stepping Back"
Thanks again for all your help. I have looked at the scan and its not really what I'm looking for I'm sorry if I'm unable to articulate it. I have built it on the freestockcharts scanner but I don't like there scan nearly as much and want to drop it. attached are 2 examples of the setup and the charts they gave. I work on this this weekend playing with the change from 20 period moving average filter and cant figure out anything. I am trying to figure out what to do for scanning and just want to confim. Trade-Ideas cannot tell me when something moved up and pulled back to the 20 period moving average? If not i need to look for something that can like tc-2000 or finviz or esingal. I would rather not becuase i like you guys system. Hi .. the limitation is that we can tell you how far away from the 20 period moving average a stock is but not that it necessarily moved up and now is coming back to it. He Barrie love the videos by the way. Can we simply add a scan for things touching the average like free stock charts. I could use an RSI filter or something like that to program things moving down. Hi .. thanks for the comment about the videos, I appreciate it. Once written, it is added to your filter list and can be treated like any other filter. If you put 0.05 in the min box, that would show you stocks that are within 5 cents of the sma20 - either within 5 cents above or below. If you wanted the above formula, you would copy it into the Source box. Pages 5 and 6 have the sma data points. Still in a long epic battle with this. I have written the below with the exact formula that you have give (i have tried to put in sma_15_20 in all formats i could see and watched your webinar a few times on these formulas) to now prevail. I it seems to give me all other filters are met but not the one that i am looking for. If i can just figure out how to add a filter (touching the 15 min 20 period SMA) I could use filters for the rest. Hi .. you will never get a formula that shows the price touching the sma, only when it is very close. If you put a very small number in the min box, e.g. 0.02, that should show you stocks that are on either side of the sma by no more than 2 cents. Sorry I should have specified that i put in .05 in the min filter as you suggested in your post above. all else that is in it is heartbeat and volume and price filters. Its currently giving me about a symbol a second not near the 15/20 or when i use your formula the daily 20. Hi .. I would use it as a Top List with the sma15/20 as a column - you will see the value that TI is returning and it should be correct.